The area of the common fields of Shipton is given as 640 acres. The table below summarises the individual holdings before and after enclosure. Click on the number to go to the full details. Hover over the map to see who the land was awarded to. Click to go to the details of the award. One Ancient foot path leading from Winslow to Little Horwood ford over part of Linhill Field allotted to Richard Lowndes Esqr. Also One other ancient foot path leading from Shipton to Swanbourne over the Land allotted to the said Vicar and to the said Richard Lowndes through Shade Lane. Also One other ancient foot path leading from Shipton to Mursley over the Red Field through Shade Lane over the said Vicar's Land and the Land allotted to the said Richard Lowndes. Also One other ancient foot path leading from Winslow to Hogston over Knowl Furlong in said Linhill field allotted to the said Richard Lowndes. close of pasture ground called Holloways Close in Lice Hill Field containing 2a 37p, Holloway's Orchard lying east, Winslow common field west, close of Matthew Hobbs south, common road from Winslow to Shipton north. piece of arable land in Red Field, Lower Clay Furlong, containing 2a 3r 3p, Cowpasture lane lying west, land allotted to Richard Lowndes east, Swanbourn Highway south, land allotted to Martha Townsend infant north. two lands of his own lying together in Lice Hill Field, Woodway Furlong, Little Horwood Road on the east. two lands adjoining on the west, containing in all 3r 22¾p, land allotted to Richard Lowndes west & north, Winslow common field south. parcel of arable land & pasture in Lice Hill Field, Coarse Furrowes Furlong & Snout Furlong, containing 18a 2r, Cowpasture Lane east, Course Furrowes south, land allotted to Richard Lowndes west, Dirty Mead Close north. his own close of pasture ground called Lamas Close in Lice Hill Field containing 1a 1r 11p, John Parkin's orchard south, Winslow common field north & west, Cow Pasture Lane east. his own close of pasture ground called Peas Furlong Close in Red Field containing 2a 3r 7p, & adjoining piece of pasture ground in the Cow Pasture of Shipton containing 1a 2r 14p, land allotted to Martha Townsend south, to Mr Guy east, Shipton Cowpasture north. close of pasture ground called Brook Close, Blackgrove Field containing 3a 25p, common road from Shipton to Aylesbury west, Shipton Brook south, land allotted to Robert Eden east. two closes of pasture ground in Red Field called Stephens's Leys, furthermost adjoining land set out for the Vicar eastward. parcel of land lying on Upper Clay and Bryar Furlong thereto adjoining northward containing 9a 1r, house occupied by Widow Shenton south, Cowpasture Lane west, road to Swanbourne north, land allotted to the Vicar east. close of pasture ground called Elliotts Close in Blackgrove Field adjoining his own orchard westward. parcel of pasture ground & arable land in Howsham Furlong adjoining on the east containing 6a, land set out for John Elliott north, land set out for Richard Lowndes east & south, land set out for Mary Henley & Robert Eden south-west. piece of pasture ground in Shipton Cowpasture adjoining, containing 4a 2r, Peas Furlong Close & land set out for John Henley in Shipton Cowpasture west, land set out for Richard Lowndes east, land set out for Martha Townsend south, Shipton Cowpasture north. parcel of arable land in Red Field, Snout & Stonny Stitch Furlongs, containing 6a 3r, land set out for Mr Guy & John Henley north, for Richard Lowndes & William Hobbs south, for Richard Lowndes east, Cowpasture Lane west. piece of pasture ground called the Half Close, Blackgrove Field, & a small part of Lamb's Leys adjoining his orchard on the west and the Half Close, containing 1a 1r 18p, George Elliott's close south, Richard Lowndes north & east. piece of pasture & arable land in Howshaw [sic] Furlong, Blackgrove Field, containing 2a 1r 3p, adjoining the Half Close on the west, land allotted to Richard Lowndes east, north & south. close of arable land & pasture ground called Drymead Close, Licehill Field, containing 3a 3r 35p, land allotted to Richard Lowndes east, south & west, Great [sic] Horwood common field north. their own close called Dirtymead Close containing 1a 3r 12p in Licehill Field, land allotted to Charles Bowler west & south, Shipton Cowpasture east. piece of sweard ground in Shipton Cowpasture adjoining Dirtymead Close on east, containing 3r 12p, Shipton Cowpasture east, land allotted to Richard Lowndes north. piece of arable land & pasture ground in Blackgrove Field, Red Lynch Furlong, containing 1a 3r, land allotted to Robert Eden west, Shipton Book south, land allotted to Richard Lowndes east, to George Elliott north. parcel of arable land and pasture ground in Blackgrove Field, Red Lynch Furlong, containing 2½a, land allotted to Mary Henley east, Brook Close west, land allotted to George Elliott north, Shipton Brook south. his own close of pasture ground containing 1a 1r 8p in Licehill Field adjoining his house on east, Winslow common field west, land allotted to Richard Lowndes south, Holloway's Close north. close of greensweard known as Smithell Close, Blackgrove Field. parcel of arable land and sweard ground adjoining, containing in all 37a, in Red Field, yearly value £30, the close and Blackgrove Field lying south, land allotted to Richard Lowndes east, common highway from Shipton to Swanbourne north, land allotted to John Perkins & Widow Shenston's orchard west. all Shipton Cowpasture (except 4a 2r 22p allotted to Richard Lowndes, William Guy, John Henley & Elizabeth Bigg) containing 93a 3r 18p, adjoining Red Field on south, Swanbourne common field south-east, Little Horwood common field north, Licehill Field west. piece of pasture ground called Knowl Furlong, Licehill Field, with adjoining meadow, containing 17a 2r 6p, Poor's Close of Winslow & Grandborough Brook south, Winslow common field west, common road from Shipton to Aylesbury east, Burnham's Orchard & Burnham's Close north. 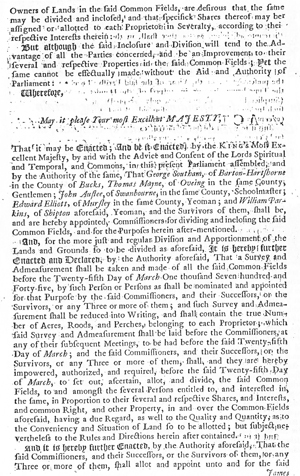 close of sweard ground called Lamb's Leys, Blackgrove Field, containing 1a 3r 37p, land allotted to John Elliott south, homestall in occupation of John Perkins west, land allotted to Richard Lowndes north & east. 3 closes of pasture ground in Shipton Cowpasture, Swanbourne common field north & east, containing 8a 3r 35p. a little close in Shipton Cowpasture called Long Varnum Close containing 1a 3p. close of pasture called Burnham's Close, Licehill Field, containing 1a 3r 10p, Knowl Furlong south, Winslow common field west, Burnham's Orchard east, Matthew Hobbs close north. parcel of arable land in Licehill Field lately inclosed and now called the Middle Ground, containing 23a 6p. parcel of land in the same field lately inclosed and now called Langland Ground, containing 10a 3r 23p, adjoining the Middle Ground. parcel of land in the same field lately inclosed called Rushmead, containing 13a 3r 5p, adjoining the Middle Ground. 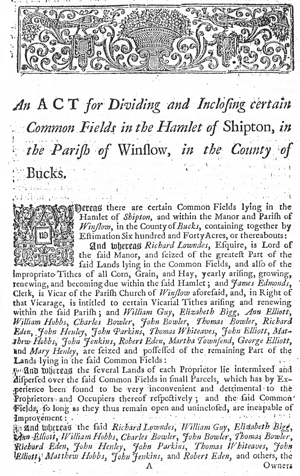 residue of the common fields not awarded to others, containing 309a 1r 6p, in lieu of his share and proportion thereof.